WASHINGTON — U.S. Rep. Elise Stefanik, R-N.Y., is the chairwoman of the House Armed Services Emerging Threats and Capabilities Subcommittee, which has jurisdiction over Pentagon cyber operations, counter-terrorism, U.S. Special Operations Command and countering weapons of mass destruction. But because it oversees Pentagon science and technology programs, it is "the subcommittee about the future," said House Armed Services Committee Chairman Mac Thornberry, R-Texas. Fitting then that Thornberry picked Stefanik — the youngest woman ever elected to Congress, at age 30 in 2014 — to lead it. A newcomer to political office, Stefanik, a Harvard graduate, worked in President George W. Bush's White House and managed debate preparation for House Speaker Paul Ryan's run for vice president in 2012. "That's what this really needs, to get the deep understanding and the sustained commitment to working on a complex problem like cyber," said Thornberry. "I need somebody smart enough and committed enough to dig into it." Stefanik's district contains Fort Drum, N.Y., home of the 10th Mountain Division rival to the 82nd Airborne Division as one of the most deployed divisions in the U.S. Army, and as light infantry sent some of the first units into Iraq after Sept. 11, 2001. Stefanik herself is oft-deployed. 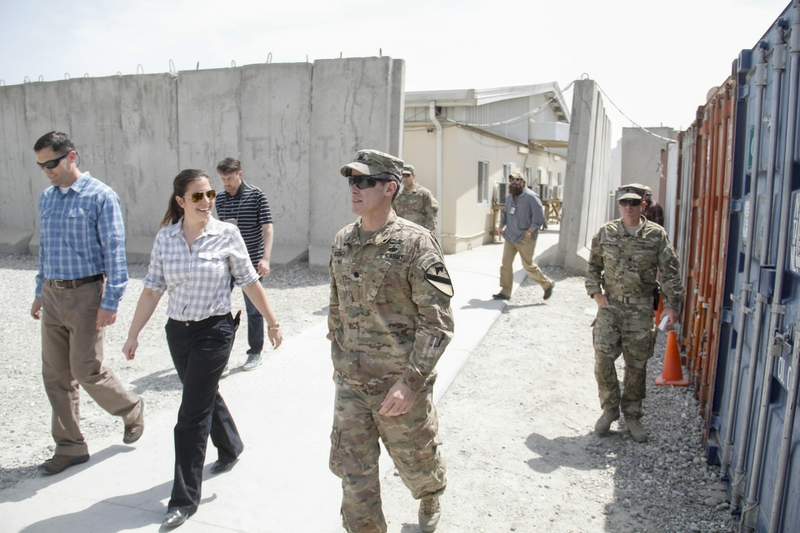 Since assuming the chair in January, when two HASC departures triggered a leadership reshuffle, Stefanik has visited Afghanistan, Kuwait, UAE, Jordan, Japan and Korea — as well as U.S. Cyber Command, Special Operations Command and Joint Special Operations Command. Some of those trips were related to Stefanik's membership on the House Permanent Select Committee on Intelligence. Defense News spoke with Stefanik before the HASC voted June 28 to send its defense policy bill, the 2018 National Defense Authorization Act, to the House floor for a vote. From there, it's due to be reconciled with the SASC version of the bill, which expected to see a Senate floor vote in the coming days. What are the high points of the ETC portion of the NDAA? The first one is strengthening cyber warfare capabilities and enhancing congressional oversight. A key part of the subcommittee mark in the NDAA was the congressional notification process for offensive cyber operations. Similar to counter-terrorism operations, Congress gets notified when those take place in addition to our quarterly briefing. That will now be the case with cyber operations as well. This is all a part of maturing U.S. Cyber Command and also ensuring that we have the information sharing between the House and U.S. Cyber Command. Our bill also prioritizes the readiness of cyber mission forces and cyber warfare tools and capabilities. We also address the resiliency of DoD networks, weapon-systems supply chains. Another important part of the cyber bill is part of [HASC] Chairman [Mac] Thornberry's Asia-Pacific focus, which is bolstering our relationships and training of cyber warfare with our Asian allies, specifically to counter Chinese and North Korean aggression and cyber threats. And an area that I am particularly passionate about is our strategy to counter propaganda and hybrid warfare. There are two NATO centers of excellence that are included in the ETC mark. One is the NATO Center of Excellence for Cyber and the second is the NATO center of excellence for strategic communication. That's an important theme of the hearings that we've hosted this past year, and it's an important issue that I have been very active on during my first term in Congress. What does this bill do for counter-terrorism and unconventional warfare capabilities, since Special Operations Command is part of ETC's jurisdiction? We fully resource and authorize [the special operations forces] command program that includes all the ongoing activities in Iraq, Syria, Afghanistan, Yemen, Somalia and Eastern Europe. It also includes permanent authority for family support programs within special operations command. That was a request that I received personally on a recent visit to Special Operations Command and Joint Special Operations Command about the importance of those family support programs. So we made that authority permanent, rather than the year-by-year extension. Is that to bolster special operations forces that that have been in such heavy rotation over the last decade and a half? It definitely is one of the issues that I discussed when I visited SOCOM and JSOC, the operational tempo is quite high for special operation forces. But really they highlighted the effectiveness, frankly, of the family support programs and why we need to ensure that they're fully funded. Instead of having to ask Congress each year to extend it, we want to make sure that we're showing a commitment permanently for those programs. On propaganda and hybrid warfare, we hear a lot about Russia being strong here, with little green men in Ukraine, but the U.S. hasn't been able to keep pace. Why is that and how does the bill address that? When you look at Russia's global strategy, information operations and the proliferation of propaganda is a major part of their national security strategy around the world. And while the US—we just don't engage in that type of operation, similar to what Russia does. But I think it's a societal difference, but I want to recognize that this is an issue and we need to have a counter in this space, and we need to work with our allies as to what our strategy will be in this space. It's particularly concerning to me when you continue to see even in media coverage in Eastern Europe, how Russia has been able to influence how stories are shaped regarding what is happening in that region. So the steps that we're taking with both NATO centers of excellence acknowledge it's a problem and acknowledge that we need to work with our allies to strengthen our capabilities to counter Russia's very effective use of information operations and propaganda. This bill emphasizes enhancing congressional oversight for cyber operations. Why is that important and how would that oversight work? Cyber is a part of 21st Century warfare, and as we're maturing U.S. Cyber Command, it is important that we maintain congressional oversight, and we continue those conversations as cyber continues to be a tool that grows in our national security arsenal. Similar to CT operation notifications, that goes directly to HASC as a committee, I get briefed as subcommittee chairwoman on those notifications as well as the staff director leads for ETC. Cyber Command's Adm. Mike Rogers has said he needs a 16 percent budget increase to become a full-fledged combatant command. Is that a move that you support and at that number? Yes, so we are fully funding the funding request for U.S. Cyber Command in bill. again, that's a recognition that as we are in the 21st Century, cyber, particularly if you look at adversary use of cyber warfare, we need to be investing in our cyber readiness. What's the goal with the provisions aimed at international cooperation on cyber? When you talk about Asia-Pacific cooperation, what does that actually mean? It means war gaming and doing training together. This is recognition that Russia, China and North Korea are increasingly utilizing cyber tools against their adversaries. So we are partnering with our allies within the Asia-Pacific. This is something that came from Chairman Thornberry's visit to the region. What it comes to our NATO allies, we need to be doing more to support readiness, training, strategizing, moving forward. We've been talking about Russia as a threat. Does it make it difficult, in Congress, to articulate the threat level posed by Russia when the president is talking about a potential reset with Russia or friendlier relations? Does that confuse the message in part? From my perspective, no. The House Armed Services Committee has been very clear in terms of our policy towards Russia. For example included in this bill, while not in my subcommittee, we move the European Reassurance Initiative from the contingency operations budget to the base, which shows permanent commitment to have that fully funded. That is part of a counter-Russia strategy an acknowledgment that Russia continues to assert itself in Eastern Europe. Separate from the ERI, have been very critical of Russia's growing role for example in the Syria conflict. So, from my position, on HASC, we have been very clear when it comes to our policy towards Russia. From your vantage as chairman of the Emerging Threats Subcommittee, would you say Russia is the largest threat to the U.S.? What would you say is the biggest threat to the U.S.? The biggest threat to the United States is the unique combination of threats we're facing today, which is more than at any point in my lifetime. You have terrorist groups metastasizing around the globe, whether it's ISIS or al-Qaeda in the Arabian Peninsula, or over 23 terrorist organizations in Afghanistan. That combined with the North Korea threat, the China threat and the Russia threat—I think that unique combination is what is our largest effort and national security challenge. Note: This interview was edited and condensed.